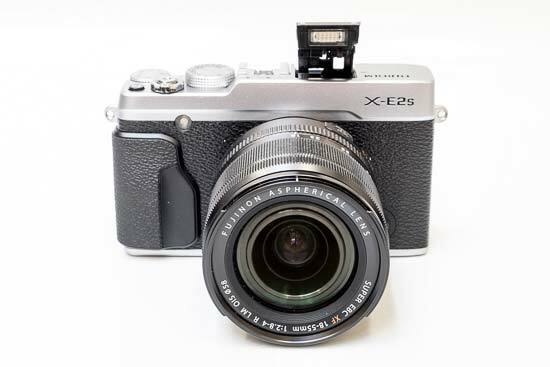 The Fujifilm X-E2S is a compact system camera that offers a few improvements when compared to its predecessor, the X-E2. These include new Zone and Wide/Tracking auto-focusing options, an Auto Mode button which activates the fully automatic Advanced SR Auto mode, an improved handgrip, the addition of an electronic shutter, and a more intuitive graphical user interface. At the heart of the X-E2S is a 16.3 megapixel APS-C sized X-Trans CMOS II sensor, which has a colour filter array that mimics film grain and no optical low-pass filter for higher resolution images, and a Lens Modulation Optimiser which automatically corrects diffraction blur. The X-E2S also has a 2.36-million-dot electronic viewfinder, 3-inch LCD screen with 1.04 million dots, EXR Processor II, hybrid auto-focus system with fast AF speeds of 0.06 second, 7fps burst shooting, a built-in flash, wi-fi connectivity, in-camera raw conversion, a range of film simulation modes, multiple exposure and panoramic shooting modes, Digital Split Image and Focus Peaking for easier manual focusing, and Full HD video recording capabilities at up to 60fps. The Fujifilm X-E2S is available in all-black or silver and black and costs £549 in the UK and $699 in the US body-only, or £749 / $999 with the 18-55mm f/2.8-4 OIS kit lens. At first glance the Fujifilm X-E2S looks virtually identical to it predecessor, with just a few subtle changes to differentiate the two. The Fujifilm X-E2S remains a classically styled interchangeable lens camera that recalls film rangefinders from the past, with a stunning retro design that draws admiring glances from everyone that sees it. Smaller, lighter and less expensive than the range-topping X-Pro2, the X-E2S dispenses with the innovative Hybrid optical/electronic viewfinder, replaced instead by the same high-resolution OLED electronic viewfinder as the X-E2. The Fujifilm X-E2S is another amazingly well-built X-series camera, with absolutely no flex or movement in its chassis thanks to the die-cast magnesium alloy top and base plates and machined control dials. At the same time, it's actually much lighter than a first glance might suggest, weighing in at 350g body only with the battery and memory card fitted, a full 100g lighter than the X-Pro2. Measuring 129 (W) mm x 74.9(H) mm x 37.2(D) mm, it's very similar in size to the X100/S cameras. The X-E2S has a subtle but effective hand-grip at the front and a space at the rear for your thumb, with your grip helped in no small part by the textured faux-leather surface that runs around the full width of the camera. 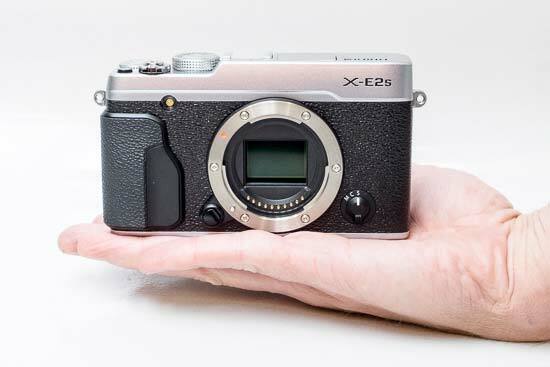 Fujifilm have made a very slight improvement to the handgrip by making part of it from a smoother rubber material, but to be honest we couldn't really notice any difference when comparing the X-E2S to its predecessor. Two small metal eyelets on either side of the body are used for connecting the supplied shoulder strap, which isn't quite as luxurious as the rest of the package. A metal tripod mount is positioned slightly off-centre from the lens and next to the memory card / battery compartment, so you'll have to remove the camera from the tripod to change either of them. At the heart of the X-E2S is the 16.3 megapixel APS-C sized X-Trans CMOS sensor. APS-C is a sensor size that's more commonly used by the majority of DSLR cameras, rather than by compact system cameras - Sony's NEX range and Samsung's NX series are the others. Fujifilm actually claim that the X-E2S's sensor will deliver image quality that surpasses most APS-C DSLRs and even some full-frame ones, and as our test photos and sample images on the next two pages show , the X-E2S actually does live up to those claims. We won't say any more at this point other than to recommend that you take a look at our Sample Images for yourself. Helping to keep the image quality high is the 18-55mm standard zoom kit lens. This offers fast maximum apertures of F/2.8 at 18mm and F/4 at 55mm, with the added benefit of built-in optical image stabilisation to help keep your images sharp. There are aperture and manual focus rings on the lens barrel, which in conjunction with the shutter speed and exposure compensation dials on top of the camera body makes it straight-forward to set the exposure. We did find though that the aperture ring is easily moved, particularly when taking the lens on and off the camera, so watch out for an incorrectly set aperture. The 18-55mm f/2.8-4 OIS is a really nice standard zoom that's certainly a cut above the kit lenses that ship with most interchangeable lens cameras. The 18-55mm lens' fast maximum apertures in conjunction with the large APS-C sensor make it easy to throw the background out of focus and achieve some really nice bokeh effects. The combination of the fast apertures and the extensive ISO range of 100-25600 (expandandable to 50-51,200) makes the X-E2S very well suited to low-light shooting, allowing you to hand-hold the camera in places where you'd usually be reaching for a tripod (if allowed) or other support. The clever ISO Auto Control setting allows you to set a maximum sensitivity (now up to 6400) and a minimum shutter speed (1/30th is a good starting point), with the camera over-riding your ISO choice if it thinks you're being too ambitious whilst maintaining a shutter speed that won't introduce camera shake. New to the X-E2S is a dedicated button for turning on the dedicated Auto Mode. In this Advanced SR AUTO mode, the X-E2S automatically selects the optimum shooting settings from 58 preset scenes, including the best AF mode. More confident beginners can then use the rear Command Dial to select a specific scene type. With its focal-plane shutter, the X-E2S has a very adaptable top shutter-speed limit of 1/4000th second in all shooting modes. Consequently there's no built-in ND filter as on the X100/S, so if you want to use the 35mm lens at F/1.4 in very bright sunlight withj the focal-plane shutter, for example, then it's a good idea to buy an actual glass ND filter (52mm). 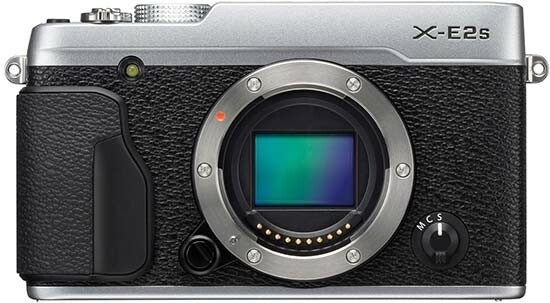 Fujifilm have also added a completely silent electronic shutter to the X-E2S which provides a much faster top shutter speed of 1/32,000th second. This allows you to continue shooting wide-open with fast aperture lenses in the brightest of conditions without having to resort to fitting a glass ND filter or using external flash and lights. There are some important caveats with the electronic shutter - the ISO range is restricted to 200-6400, you can't use the flash at all, and the slowest shutter speed is only 1 second, but overall it's a great addition that makes the X-E2S more versatile. It's also possible to set the electronic shutter in 1/3 steps from a range of 1sec to 1/32000sec. The Fujifilm X-E2S's auto-focusing speed is further improved on the previous model, with a quoted fastest auto-focus time of just 0.06 seconds when using the 18-55mm zoom. The X-E2S has an ultra-fast hybrid AF system with both a conventional contrast-detection system and built-in Phase Detection pixels which enables the camera to achieve a focus lock so quickly and accurately. If you mostly use auto-focus rather than manual then this one improvement alone is reason to upgrade from the X-E1. The X-E2S has 49 individual AF points in the Single Point mode, laid out in a 7 x 7 grid, with the ability to change the size of the focus point via the rear command dial to achieve more precise focusing. In addition to the standard 49-point Single Point mode, the X-E2S is the latest X-series camera to offer Zone and Wide/Tracking modes. These two modes use a larger 77-point area to capture moving subjects. In Zone mode, you can select a 3x3, 5x3 or 5x5 zone out of the 77-point AF area. During AF-C focus, the X-E2S continually tracks the subject, positioning it at the centre of the zone. The centrally positioned 3x3 and 5x3 zones in particular deliver fast focusing thanks to the on-sensor phase detection AF. Manual focusing is activated by setting the focusing switch on the front of the camera to Manual and using the ring that encircles the lens to focus. The X-series lenses have an electronically coupled focus-by-wire manual focusing ring, rather than a physical one. We criticised the original X-E1 for taking a lot of turns to change the focus from 0.1m to infinity, commenting that it was a much better idea to use the AFL/AEL button on the rear of the camera to set the focus automatically, then use the focusing ring to micro-adjust the focus manually, if required. This is still a viable technique, but is perhaps no longer required as Fujifilm have cleverly made the focusing ring more sensitive to how you use it - turn it slowly and the focusing distance changes slowly, but turn it more quickly and the camera quickly moves through the distance scale. It takes less than 2 full turns and a couple of seconds to jump from the closest focus distance to infinity, a big improvement on the X-E1. The X-E2S also now offers not one, not two, but three ways of manually focusing. Firstly, there's a handy blue distance scale along the bottom of the viewfinder (both the OVF and EVF) and on the LCD screen if you're using that for composition, with a red bar indicating the the focusing distance and a white bar showing the depth of field, which actually changes in line with the current aperture - very clever. In addition to the AFL/AEL button, the X-E2S has another trick up its manual focusing sleeve in the shape of the rear command control (the dial which sits under your right thumb). You can press this in to magnify the view in the electronic viewfinder, with the ability to then pan around the frame by pressing the AF button and spinning the command dial. This makes it much easier to judge precise focusing. The second manual focusing method is the Digital Split Image feature. Harking back to film cameras of the past, this displays dual images on the left and right which then need to be lined up together for accurate manual focusing, enabling accurate focusing especially when shooting wide-open or for macro shooting. It's much easier to understand in practice than written down. The third and final method is the Focus Peak Highlight function, which displays a white line around the subject when it's in focus, something that Sony users in particular have been enjoying for a while. Both of these additions make manual focusing on the X-E2S more of a pleasure than a chore, although the revised fly-by-wire manual focusing ring operation is arguably more important. The X-E2S utilises a focal-plane shutter rather than the leaf shutter that the X100/S has, much like a regular DSLR camera. This results in slightly noisier operation and a much slower flash-sync speed of 1/180th second (versus the X100's 1/400th second). To make the camera less obtrusive there's a Silent menu option which turns off the speaker, flash, AF-assist lamp and most importantly the artificially-created shutter-release sound, instantly making the X-E2S perfectly suited to candid photography. The Fujifilm X-E2S offers two ways of composing your images. The 3 inch LCD monitor on the back offers 100% scene coverage and 1.04 million dots. The LCD screen has a handy Info view which presents all of the key settings at once, or you can switch to the Standard or Custom Live View modes, with the latter offering 14 customisable options (these are also used for the electronic viewfinder). There's also an excellent electronic viewfinder, which has 2,360,000 dots and provides the same exact 100% coverage as the rear LCD screen, plus a parallax corrected view, accurate preview of exposure and depth of field, and the ability to see all of the information that you can view on the rear LCD. The X-E2S also has a built-in eye sensor so that you only have to hold the camera up to eye-level to switch between the rear LCD and the electronic viewfinder (or you can press the View Mode button). In terms of operational speed, the Fujifilm X-E2S is very fast. Shutter lag is virtually non-existent on this camera (0.05 second), so once you have set the focus, you'll never miss the moment because the camera can't fire the shutter quickly enough, shot-to-shot time of 0.5 second, and it starts-up in just 0.5 second too. The write speeds from pressing the shutter button to recording to the SD / SDHC / SDXC memory card are faster too. Shooting a single RAW + Fine JPEG takes about 1.5 seconds to record to the card, a big improvement on the X-E1. Continuous shooting speeds are a top rate of 7fps for around 28 JPEGs or 8 RAW files, depending on the speed of your memory card, with a slower 3fps speed with AF tracking also available. Note that both the focus and the exposure are set according to the first frame in each series, so it's not a particularly good system for tracking fast-moving subjects in varied lighting conditions, Thankfully the camera doesn't lock up completely for a long time if you shoot the maximum number of images in a burst, allowing you to continue shooting after just a few seconds. One area in which the Fujifilm X-E2S excels is its handling, thanks in no small part to the numerous external controls that make changing the key settings a breeze, especially when holding the camera at eye-level. Surrounding the 18-55m lens is a circular aperture ring, although it has no markings due to the variable aperture. This dial also allows you to choose third-stop apertures. On top of the X-E2S is a large, tactile control dial for setting the shutter speed, with settings ranging from 1 second to 1/4000th second, an Auto option, a T setting for longer exposures (2 to 30 seconds, set via the circular command wheel) and a Bulb mode for exposures up to a whopping 60 minutes in length. Alongside the shutter speed dial is another tactile dial for changing the exposure compensation, now with an expanded range of +-3EV - together these three controls make it extremely easy to set the exposure. 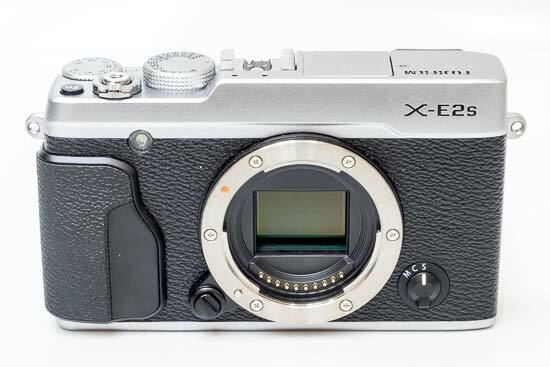 Four other controls complete the X-E2S's top-plate. The small but responsive shutter release button is encircled by the On/Off switch, which in turn has a thread for a very traditional mechanical cable release - there's no need to buy an expensive dedicated accessory for this camera. Alongside is the Fn button, which by default provides quick access to the ISO speeds, but can be customised to suit your own needs from 12 different settings. Further customisation is available via the 7 Custom Menu options, which let you create, save and recall up to 7 sets of user-defined settings. Finally there's an external flash hotshoe for suitable dedicated external units, and the handy built-in pop-up flash which has a guide number of 7 at ISO 200. This is released via the Flash button on the rear of the camera, and its clever hinged design positions it above the lens and helps to reduce red-eye. The X-E2S features built-in wi-fi connectivity, although it's rather restricted in use as it has to be paired with a smartphone. Install the FUJIFILM Camera App and you can transfer your pictures immediately to a smartphone or tablet PC and then edit and share them as you wish, transfer stills and video onto the camera, and embed GPS information in your shots from your smartphone. Note that you can't control the camera remotely, only transfer images. The FUJIFILM PC AutoSave software provides a simple means to back up your photos to your home PC. The Fujifilm X-E2S can record full HD 1080p movies at 60/30fps with stereo sound and a high bitrate (36Mbps), by default assigned to the Fn button on top of the camera. It's fair to say that the X-E2S's movie mode isn't overly advanced. You can set the aperture and shutter speed before recording begins, but not during, and you can also set the Film Simulation mode, so black and white footage is possible, and the exposure compensation. Continuous auto-focusing is possible, although it still tends to hunt around before locking onto the subject, and manual focusing is also available (with the same caveats as for stills). There is a HDMI port for connecting the X-E2S to a high-definition TV, although as usual there's no cable supplied in the box. Also missing is a paper copy of the otherwise helpful manual, which is supplied on CD-ROM instead, along with the consumer MyFinepix software the slow and rather unintuitive RAW convertor (essentially a specially customised version of the commercial Silkypix application). 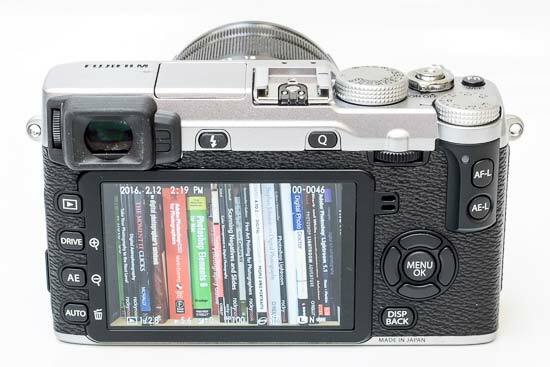 The X-E2S has a logical rear control layout. There's a vertical row of four buttons on the left of the LCD screen for choosing image playback, the drive mode, exposure mode and the new Auto mode button. Above the LCD are the Flash Release button and the Q button. This provides quick access to lots of frequently used shooting settings including the ISO speed, White Balance, File Size and File Quality, with the 4-way controller and command dial used to quickly change them. To the right are the rear control dial, separate AF-L and AE-L buttons, and two activity LEDs. A 4-way controller is used to change the shutter speed and aperture, toggle the macro mode on and off, and set the AF point. In the middle of the controller is the Menu button, which accesses the eight Shooting and Set-up menus. Underneath is the Disp/Back button which is used for changing the LCD display or going back.